This gorgeous design of a fabulous baby pram is sure to make any new parent smile. 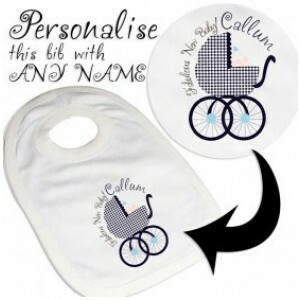 The bib is also personalised with the baby's first name. Fabulous new baby is as standard with blue colours. Please enter Baby's First name into the text box below. A truly lovely New Baby special personalised Gift. Please allow 3-4 workings days (UK ONLY) from placing your order for delivery of your personalised bib.